Owned and operated by Americans Martin and Buck, L’Imprevu, located on the quintessentially Parisian street Rue Quincampoix, offers a surprise around every corner, from mismatched furniture (including a pair of bejeweled thrones) to a wall-sized earth-tone mural to a throng of plants cocooning one of the seating areas. Even the drink menu is offbeat, offering more than two dozen cocktails, including such unusual fare as BCBG (Basil, lemon juice (Citron, in French), sugar cane, more Basil and Gin; the El Sueno, a mix of tequila, agave, lime juice, Tabasco sauce and fresh cucumber; the Elephant Rose (Pink Elephant), combining tequila, triple sec, strawberry syrup and grapefruit juice; the Green Hornet, a mix of tequila, Get 27, lemon juice and tonic; and the Queen Bee, comprised of gin, raspberry cream, cranberry juice, apple juice and fresh mint. Cocktails are grouped in such fun categories as “Cherubins (non-alcohol drinks),” “Les Petits Mickey (Little Mickey),” “Les Players,” “Les Machos” and “Les Vrais, Les Durs) The Real, the Hard.” All are priced from 8.90 euros (for the Mickeys) to 10.90 euros (the Real/Hard). For just 7 euros you can get one of the five non-alcoholic “Cherubins,” including one of the bar’s most popular drinks, the “Scunky”—a mix of passionfruit nectar, lime juice, lemonade and raspberry syrup. Happy hour, held daily from 6-9 p.m., is an exception bargain, with cocktails Blue Lagoon, El Diablo, Gin Sling, Il Sole, Mary Pickford, Purple Haze and the cocktail du jour offered at an extremely affordable 5.90 euros. For the same price, non-alcoholic Hawai (yes, misspelled) and Paradise also are available. 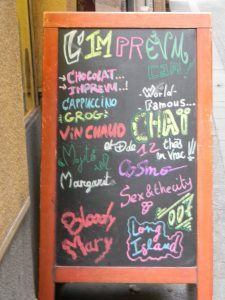 There’s also a very large selection of hot teas, one of the venue’s calling cards among the many local Parisians who’ve made L’Imprevu a regular hangout. Try the Oolong Fleur d’Oranger (orange blossom); the Lune Bleue (Blue Moon), a black tea with citrus, blueberries and calendula; or the Sencha Gingembre Citron, a green sencha tea with lemongrass, ginger and lemon. Better yet, try the Rooibos de L’Imprevu Cafe, a special drink crafted by the venue’s staff, that prepares a rooibos tea with a slow infusion of agave syrup and such flavors as vanilla or a combination of cardamom, ginger, cinnamon, anise and clove. Delicious! 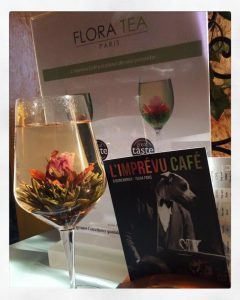 Of course, L’Imprevu also offers a full range of French wine, as well as several hot drinks, fresh fruit juices, iced teas (a rarity in Paris), and several European beers on tap and in bottles. The crowd is 50/50 male/female, most in their 20s and 30s. Despite L’Imprevu’s hipster ambiance, its staff and clientele are friendly, chatty and pleasantly attitude-free. 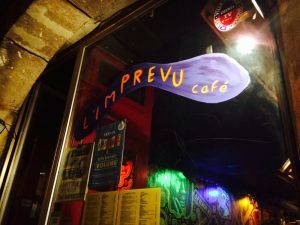 And while many consider L’Imprevu to be a gay bar, you’re just as likely to find straight neighborhood regulars as members of the city’s LGBT community. 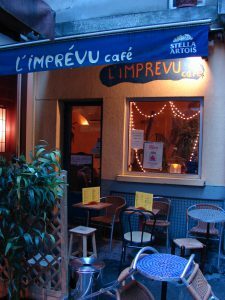 L’Imprevu Cafe is located at 9 Rue Quincampoix and is open Tuesday-Sunday from 3 p.m. to 2 a.m. (closed Mondays). Metro: Chatelet. This entry was posted in Bars, Drinks, Les Halles, LGBT Paris, Right Bank and tagged L'Imprevu, Rue Quincampoix by Bob Adams. Bookmark the permalink.